How to increase Header avatar size? Other than editing the header file, is there an easy way to increase the header avatar size (menu icon)? If I scale the current image, it gets blurry. I think the medium avatar image is used and is closer to 32px. I wanted to put a larger image that is closer to 45 px. Is there any similar code for the header avatar? Thanks! @Trash thanks, but isn’t that script for the topic and post avatars? I wanted to change the size of the avatar icon in the header (the one we click to open the notifications menu). And not the stuff below! As long as you are okay with that though, you just want to change medium in avatarImg('medium', to whatever size. This changes the size on mobile as well, fyi. Otherwise it appears to work to me, do a little double checking to make sure everything is okay but I don’t see any errors immediately myself. 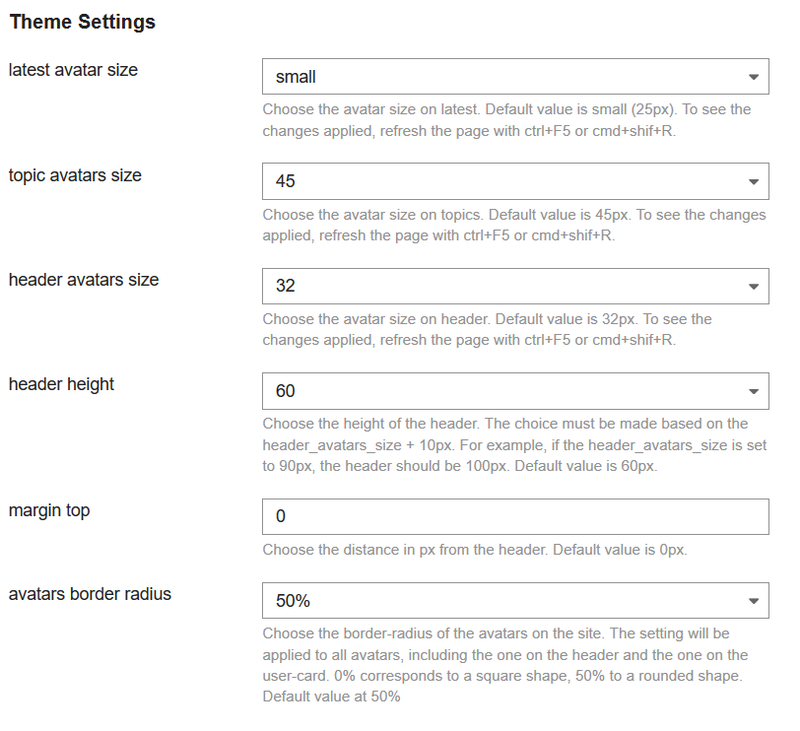 The change that made the post avatar update easier was the addition of the size setting in that widget (with the new plugin api call to update settings) - something similar would work here and get around the messiness, but I’m not sure what the process is for that change. One the one hand maybe the Discourse team doesn’t want to individually add settings for every little thing, but also this isn’t hugely ideal? Dunno, though. How to change topic avatar size? Instead of the big ole mess up above. I just tried this and… my whole forum disappeared haha! Switched back to the big 'ol mess for now. Not sure what I did wrong, but I lost all my formatting, content, and the header, when I used your smaller script. I’m ok with a backend big 'ol mess, when the alternative is a front-facing big 'ol mess. Is your forum fully up to date with latest? 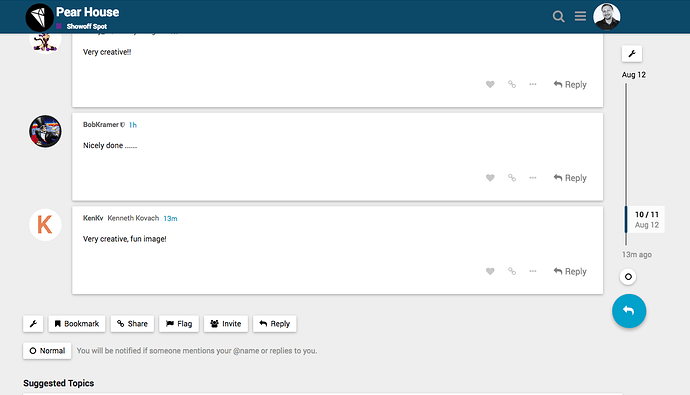 That script is copied & pasted from my forum customization that I used to double check it worked. And I just copied it again, directly from my post above, and it works fine. I’m not sure why it didn’t work, though I have quite a bit of customization going on now that I got it to work. Could be a conflict maybe? Latest is on 1.7.0.beta2, you aren’t up to date enough. The commit required for this is only like an hour old at this point, you really need to be on the very latest if you want to use it. Easiest way to see if you have the commit is click that Installed version link. If you see the commit from @eviltrout in the list, then you don’t have it. Ah, yes, the commit shows as ~2hrs old. That’s likely why it broke - oops! 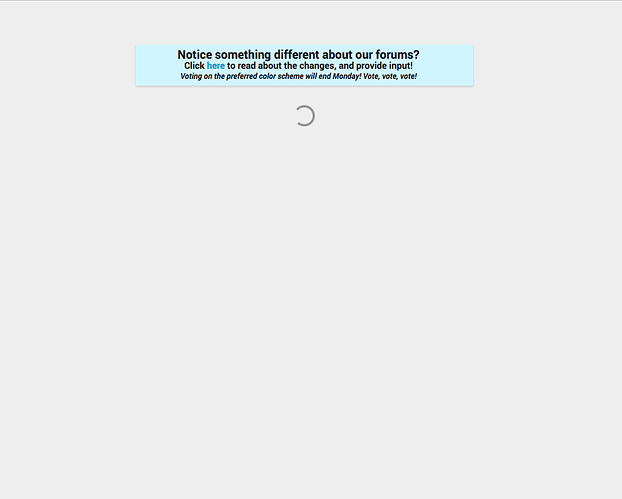 The forums go down for 15 minutes at a time when I update or add a plugin, so I try not to do that too often. When the forums are down, I always get support tickets on my main Help Center, so I try to do it around lunch or late at night. I’ll update and test it again in a few days, we have a product update release dropping in a few days, and I need to shift focus to that. I’ll update this thread when I can confirm I got it working. Thanks for all the help! How are you updating? Because if you do it from /admin/upgrade (doesn’t help if you go through a staging server first either), it shouldn’t go down for 15 minutes, it should be no more than a minute or 2 at most. But don’t let that convince you to pull that in immediately versus waiting till a time you are more comfortable with.